Will you judge me if I admit that this episode left very little impression on me? I watched it and almost immediately forgot it, even though things happened and events developed. Is TVD spinning its wheels or burning through plot? Do we even know the difference anymore? There was lots of fodder for the Steroline and Benzo shippers this week. Caroline is excited about her wedding; Bonnie chose to sacrifice Damon to save Enzo. I feel bad for Caroline, as whenever anyone is happy on this show, things inevitably end badly. And I feel bad for Bonnie, who exists in a state of perpetual awful. Seriously, has she been happy for more than two episodes in a row, ever? 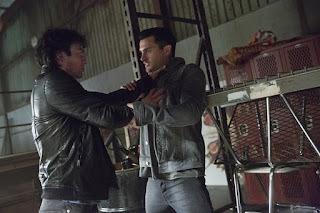 The Big Fight between Enzo and Damon was more funny than anything else. Damon has plot armor, and I think Enzo does, too. That meant the best part of the fight was the rampant neck-breaking. Never turn your back on a rageful vampire, guys. Haven’t you learned anything in eight seasons? Bonnie has. Perhaps. She brought up the same point that Sybil did: does Damon deserve life, if it comes down to him or someone else? Many characters have brought up that question this season, which makes me wonder if this is a coincidence or an Important Theme. Prediction: Damon will go to hell and experience unbearable agonies and torments for centuries, but return to TVD land in what appears to be no time at all, all of his sins expiated. Including, apparently, the sin of killing Tyler Lockwood. If I had to point to one scene that indicates why this episode flopped for me, it’d be Tyler’s death (if he is dead). He came out of nowhere but claimed that his death would be the last straw in Damon’s potential redemption. In other words: Tyler told us why his death was important, rather than the script showing us the same thing. Also: really? Does Team Mystic even remember Tyler exists? I’d sort of forgotten, myself. And Damon has always disliked him. Alaric did get some good moments this week. Sure, the pitchfork thing was silly, since that thing looked so much like either a tuning fork or a barbequing tool, but we’ll let that slide. Alaric’s joke about getting tenure was funny—does he still have an appointment at Whitmore College? (Or, even worse: does the Armory have a tenure track?) But he got to hit Damon with his car (funny) and managed to accidentally clue his plucky intern into what is at stake, which she deserves to know. Especially since she’s doing unpaid labor at a place that now acts as a jail for the biggest threat in the South: the caged Sybil, who gets a cot and a cell and for some reason, hasn’t been killed. Is her cell soundproofed? Can we assume she’ll break out soon, or that Satan will break her out? • Sybil reminds me of Glory from Buffy. I didn’t like Glory. • Mythological complaint: I’ve always loved the sibyl in her Aeneid iteration. I read that epic when I was at an impressionable age, and the idea of a powerful, knowledgeable woman with a sort of chaotic intelligence really appealed to me. So I hate that this Siren has taken her name. • Does Sybil’s mind-control only work on men? • Do people live in Mystic Falls, or is it still a ghost town? • You can’t spell Damon without damn, you know. One out of four applesauce penguins. I agree that instead of going out on a high note the season seems like more of the same we saw in season 7 and in season 5 with the traveler nonsence. Kai was just a fluke I guess. I couldn't even remember if Tyler was still alive in the first place. Where's Matt? Also, when did Mystic Falls get back up and running after the vampire takeover last season? Matt decided at the end of last season that vampire problems were not his problems and bounced, so I expect we won't be seeing much of him.